LENNOX HVAC SYSTEMS - Bosworth Co. The Lennox company has based their business on trust, quality, and innovation. The passion behind the Lennox name is driven by a desire to create an enhanced home environment for their customers, and a better global environment for generations to come. The commitment Lennox pledges to their customers extends to the products they manufacture. Lennox makes sure every product meets industry safety standards, as they value the safety of their customers. Lennox has stood for reliability, innovation, and dependability for over 125 years within the heating and cooling services sector. Their products are more energy efficient, comfortable and convenient than ever before. 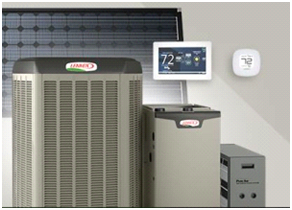 All Lenox dealers are HVAC experts, however, Premier Lennox Dealers are top-tier. The Bosworth Company is an 11-time winner of the Dave Lennox Premier Dealer Award. We are trained to deliver a premium level of service and comfort; we listen, respond to your needs, and pull all of our resources together to present the best Lennox solution to you. As certified Dave Lennox Premier Dealers, we are periodically inspected to ensure all customer satisfaction standards are being upheld. In addition to being held to the Premier Dealer standards of service, we have the ability to offer some of the finest products available, including those from the Dave Lennox Signature Collection. The Bosworth Company values your comfort and would be happy to provide you with more information on the Lennox system that is best for your home.